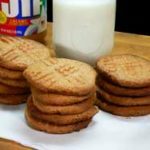 Easy, step-by-step, photo illustrated instructions for making these surprisingly tasty Peanut Butter Cookies. Printable recipe included, in case you need it. 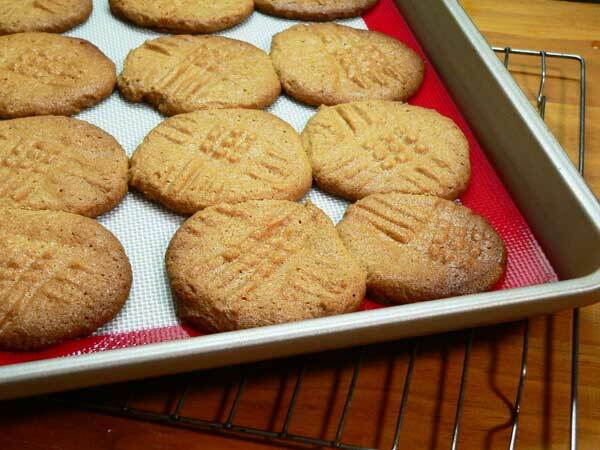 3 Ingredient Peanut Butter Cookies – As tasty as they are easy. While talking with a good friend recently about cooking, as we often times do, she told me she had a recipe she wanted me to try. She said it was for Peanut Butter Cookies, but it only used three ingredients. I might have been a bit interested. Smile. She proceeded to share the recipe right off the top of her head, and surprisingly, I remembered it as well. Not too bad for old folks huh? Since I’d not heard of them before, I had to do a quick search of the Internet and quickly found lots of recipes for making them. I guess just about everybody likes a quick and simple recipe. 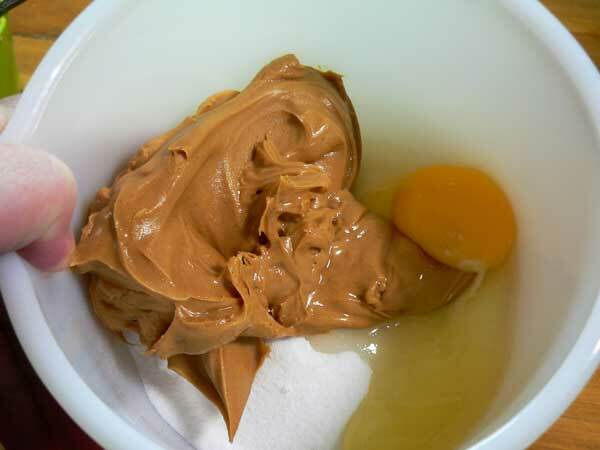 You can make this with your favorite peanut butter of course, whether it’s creamy like I prefer, or the crunchy version. Both will work well. You must add the egg though, so don’t try to leave that out. Also, the cookies do spread a bit while baking, so give them a bit more room on the pan than what I did in the photos if you want them to come out not sticking together. I made 22 of these 2 inch cookies from this one recipe. You could easily double it if you want to make more. I’m pretty sure you’ll end up making more eventually as they really are very tasty. This is a quick fix when you want something sweet but can’t find anything in the cabinets. It’s highly probable that you’ll have the necessary three ingredients on hand about all the time. So, join me in discovering this great new super easy peanut butter cookie. I don’t know why it took me so long to learn about these, but I’m glad my friend shared the recipe with me. Ready to try them? Alright then, let’s head on out to the kitchen, and… Let’s Get Cooking! 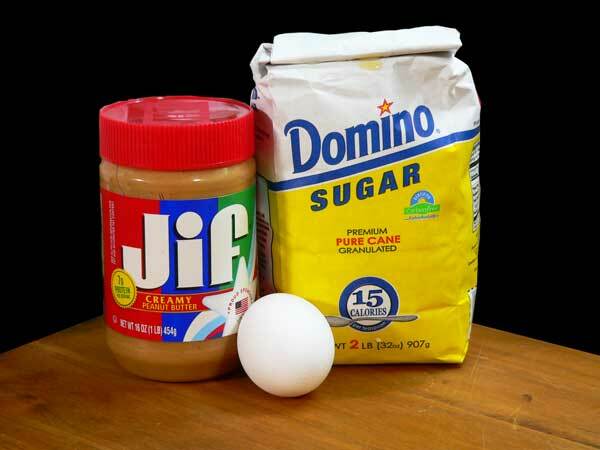 3 Ingredient Peanut Butter Cookies – You’ll need these ingredients. Place the sugar in a medium sized mixing bowl. You’ll need a sturdy spoon or spatula to mix everything together. Stir well until fully combined. Scoop the dough out onto a silicone mat or parchment lined baking sheet. I’m using my new OXO 2 inch cookie scoop to make these. I’m also placing them on the silicone mat inside the Non Stick Pro baking pan that I recently acquired from our good friends at OXO. 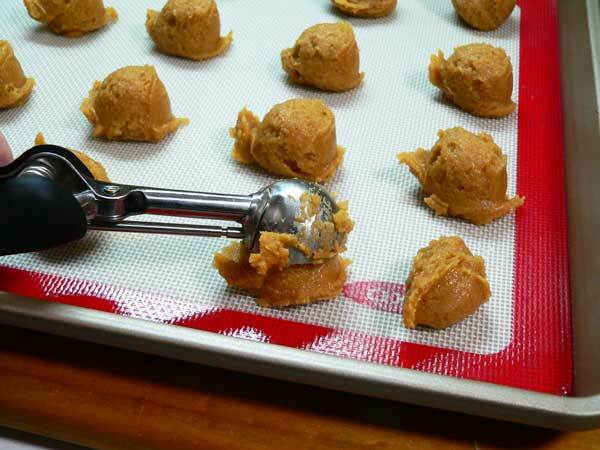 Slightly wet your fingers and gently press down on each ball of cookie dough to flatten it out a bit. Then, use a fork to make the cross marks like we’re doing here. 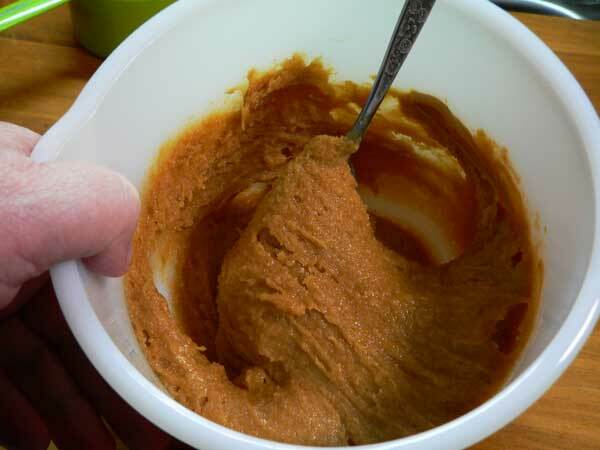 According to the “Internets” adding peanut butter to dough makes it more dense which in turn makes it harder to bake through. Pressing the dough flatter with the hash marks makes them bake more evenly. Who knew? Smile. Place the cookies on the middle rack of your oven that has been pre-heated to 350F degrees. Let the cookies bake for about 12 to 15 minutes, or until the edges start to turn slightly brown. When done, remove the pan from the oven and place it on a wire rack for the cookies to cool. These spread out more than I thought they would, so be sure to give them plenty of room when you place the scoops of dough in the pan. I made 22 of these 2 inch sized cookies from this recipe. I’m sure you could easily double it if you wanted to make more. A cold glass of milk is optional, but it does go good with them. Smile. Super easy to make, and ready in just minutes. 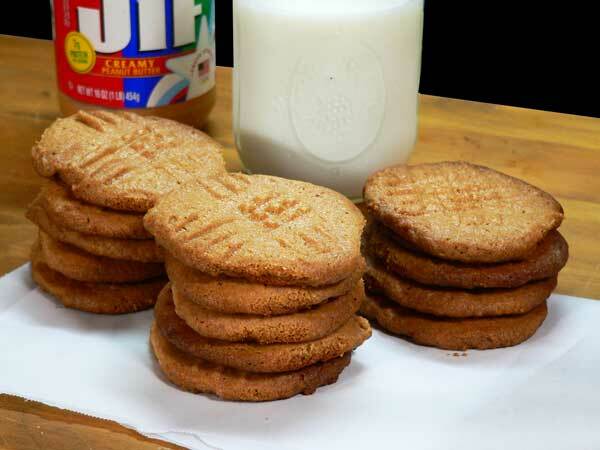 3 Ingredient Peanut Butter Cookies are as tasty as they are easy. 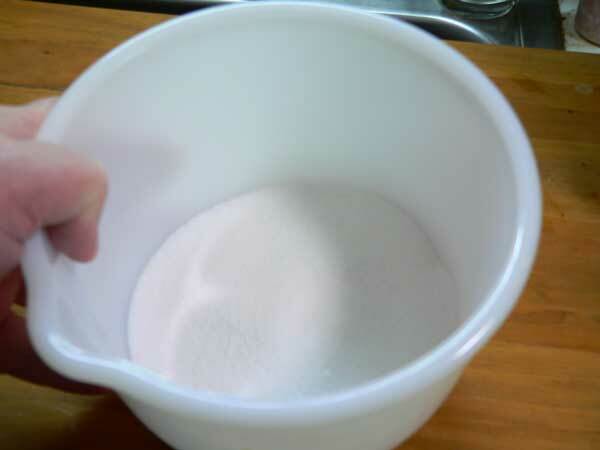 Place the sugar in a medium size mixing bowl. Use a sturdy spoon and mix all the ingredients together. Line a sheet pan with parchment paper or silicone mat. Use a small scoop to place dough on the sheet pan. Lightly press down on the cookies to flatten the dough balls. Use a fork to mark indentations into the top of the dough. Place pan in oven, bake for 12-15 minutes. Remove pan from oven, place on wire rack to cool. 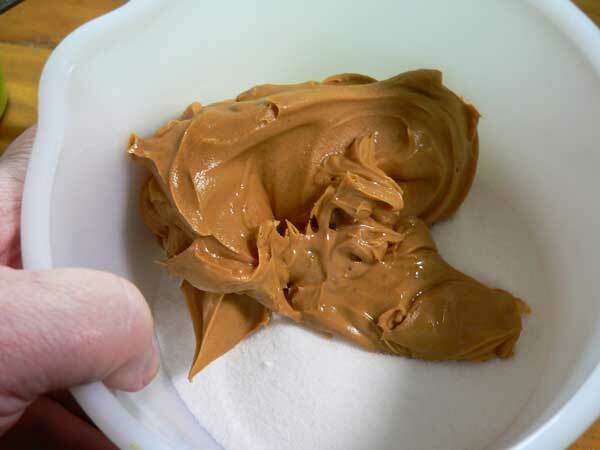 Use your favorite peanut butter, creamy or crunchy. 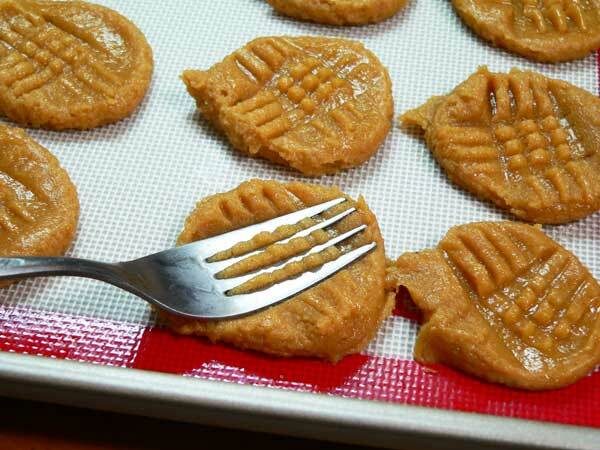 Have you tried these 3 Ingredient Peanut Butter Cookies? What did you think of them? Share your memories of this super easy cookie with us. It will only take a minute or two for you to leave your comments in the section below. Mix all together – if it’s still crumbly add a smidgeon more water. Roll between hands into walnut size balls, place on oiled baking tray (Spray ‘n Cook is great). Flatten with heel of hand or two fingers. Bake for around half an hour at 160 degrees. You can use the cheapest peanut butter so long as it isn’t the soya and peanut butter mix – dogs weren’t designed to eat soya and quite a few are sensitive to it. I wear latex gloves when I work with it (the sort that you wear when you dye your hair), a bit stronger than the disposable polythene ones. So you don’t even get messy and the mixing bowl will be almost dry. You can make them larger if you want, but my dogs don’t seem to notice size. If they’re completely dried out you can store them in a plastic bag, otherwise go for a tin. You can add chopped comfrey (great for dogs with bone or joint problems), chopped spinach, parsley, or really whatever you like. They love it anyway. If you use carrot make sure you graunch it right down in the food processor because they can’t digest that unless the cellulose “walls” are broken right down. Apple’s also great – don’t know why, but they love it. If you wanted I guess you could leave them to dry out completely in the warming drawer overnight but I haven’t tried that. Hi Dorothy, Thank you for taking the time to share this recipe for Dog Biscuits with us. I just want to make sure everyone understands that it is for DOGS. Smile. Been a long time since I had a dog of my own. I had a friend a few years back that made and sold lots of dog and cat treats in her pet grooming business. It was always interesting to see what she made. These sure are easy! I must try these, they look delicious! Glad to hear you were ok too, sorry that you didn’t get your treats, but happy that you made the cookies and tested them for all of us. How is the vertigo? In the Mint Hill,NC area, we fared ok. We did get about 7:46″ of rain in the three days we were under Florence. Lots of wind, we usually lose power, but thankfully, we did not, we had brownouts each day. We are on well water, so no power, no water. So Thankful! One of my sons lives in the Concord-Harrisburg area, just 20 minutes from us, they just had drizzle most of the time, with wind. Go figure. I must say Thankful!! again. Lots of yard cleanup to look forward to. I need to bake those cookies for energy!! Hi Steve, I have made these cookies only I used a half cup of Stevia in place of the sugar. Very good for those watching sugar. I’ve also used crunchy peanut butter. It really is a good peanut butter cookie! Thanks for the recipe. Glad to hear that the storm was good to you as it was here in Richmond. God is good! Your comment about sweet potatoes reminded me of a recipe for sweet potato latkes that I made last week. They are really good when served with cranberry chutney and sour cream. I served them as a side with grilled ham steaks and butter beans. P.S. if you are interested I can send you the latke recipe.